Banana Bungalow Hollywood kohteessa Los Angeles, Yhdysvallat: Varaa nyt! Must cancel 14 days before arrival to receive a refund. All cancellations are subject to a 10% processing fee. Security deposit is a valid credit card that will authorize $300 per room or $100 per person(dorms). Cash deposit is accepted for dorms but not for privates. Banana Bungalow Hollywood is a converted former motel with a nice outdoor area and courtyard, giving guests somewhere to sit in the LA sunshine. Hostelworld visitors tell us their 'good atmosphere invites [guests] to hang out and have fun'; it 'has a very good vibe, perfect location and there is always something going on' such as tours, parties and barbecues. Our travellers say this is 'a funny, cool and a clean place for young people'. We like that this hostel has parking, ideal for those on a road trip up the West Coast. Our hostel is a very popular international destination in a great location. We’re right on Hollywood Boulevard in the heart of Hollywood. You'll be centrally located in Los Angeles and within walking distance of all the action. We’re also close to the subway and bus stops to get around LA. Our hostel is an oasis for backpackers, featuring all the amenities, activities and events that travellers truly want. This includes friendly staff to help you, a fun international crowd to hang out with, cool rooms, lots of hip common space, a great vibe and atmosphere, and daily events and activities that supply lots of fun for free or very cheap. This place was a cool Hollywood motel that has been remodelled into a colourful retro-designed hostel. Each of our dorms has six-to-eight beds plus a private bath and its own kitchen. That's right; we’re the only hostel in Los Angeles with kitchens available in our dorms! The six-bed dorms have six beds in one room, while the eight-bed dorms have four beds each across two rooms. They also have colourful decor plus satellite TV with hundreds of channels. There’s free lockers in every dorm as well as free linen and free luggage storage. All of our rooms are kept very clean according to the high standards of housekeeping. 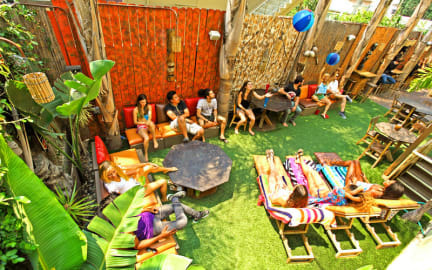 Plus we have the best private rooms of any hostel in LA and at the cheapest prices, ranging from small to deluxe with kitchens. Great for couples! Our common space is fantastic, featuring a huge, warm and welcoming courtyard that has music, palm trees and a sidewalk café. We also have a billiards room with music, dancing, live music, comedy shows and karaoke stage, a movie theatre with big screen and 5.1 surround sound and a Tiki garden with sunbathing, music, refreshments and a barbeque. There’s coin-operated laundry machines with free soap. We have tons of freebies for our guests, like free internet and Wi-Fi, free parking near the rooms, on a limited and first come basis, free breakfast, free coffee and tea all day, free barbecues, free movie nights with the latest releases, free foosball and free ping pong. Not enough to keep you busy? We also have party bus limo rides, pub crawls, poker nights, billiards tournaments, basketball, Runyon Canyon and Hollywood sign hiking tours, a beach shuttle and theme parties. Our friendly staff can help you get free TV show tickets, special Hollywood club access or cheap car rental. We also have courtesy phones for free calls in the USA and discounted weekly rates. Best of all, there’s no curfew and no lockout! Right next door is LA's best Thai restaurant, serving fantastic $5 lunches and delicious $10 dinners! From here you can walk to many iconic spots, such as Hollywood and Highland, which has become the Times Square of LA, with the Walk of Fame, live TV shows, the Chinese Theatre, endless shops and food and the Dolby Theatre, home to the Academy Awards. The Cahuenga Corridor has over 28 bars and nightclubs offering a party for all moods and all types of hipsters. Hollywood and Vine has the Metro link which is LA's subway and is the famous spot where broadcasters started it all. Sunset and Vine has been redeveloped with millions of dollars, having shops, theatres, restaurants and things to do for any budget. Hollywood and Western has a subway metro station and huge discount grocery store. Theatre Row is also very close with an array of small acting theatres; this is where many big stars get their start acting and performing. And of course, the Sunset Strip is probably the place you’ll see the most stars at night partying in some of the most famous nightclubs in the world. We have tours and shuttles around Los Angeles that include a fantastic tour of LA that takes you in an air-conditioned van to many of the interesting and famous sights of Hollywood and beyond, including Beverly Hills and movie stars' homes. We also can arrange tours of Universal Studios, Disneyland, Six Flags Magic Mountain, L.A./Hollywood City Tour, Venice Beach, Knott's Berry Farm, Celebrity City Tour, Getty Museum, nightclubs and more! People under the age of 18 are not permitted to stay in dorm rooms. Anyone under 18 must be accompanied by a parent or chaperone. Couples must reserve two beds. To check in to a dorm you will be asked to provide proof of onward travel. Please do not reserve a dorm without proof of current travel or you will not be accepted at check-in, sorry. Please reserve a private room if you have no proof of travel. Published rates are for cash payments and include a five percent discount, other payment methods including debit or credit cards do not receive this discount. We try to put people traveling together in the same dorm room, however, due to availability, there is a slight chance parties booking dorms will be in separate rooms. Maximum stay is 14 days within a 4-month period . Very friendly staff and, atmosphere and the best location!! Would recommend! Good vibes; a good place to make new friends and spend time with other travelers. Daily activities and parties. Breakfast is the average, staff friendly and helpful. Wifi could be better though. Overall experience really good according to some other budget hostels in Los Angeles.